After 30+ years of cooking dinner, I’m thrilled to be passing on the torch to Eddie…grillin’ is great! It’s absolutely amazing what one can cook on the grill. Most of my favorite recipes that I baked in the oven at home in North Carolina can be cooked on the outdoor propane grill. For instance, Eddie has cooked manicotti, lasagna, several casserole dishes and chicken dishes that I usually baked in the the oven. Everything has turned out perfectly! Electric is very expensive in Costa Rica as it’s government controlled, so I only use the oven for baking cookies and banana bread, which I don’t do very often here. (In the near future, I’m planning to cook banana bread on…you guessed it..the grill!) Who knew that cooking on the grill could be so versatile? If I had known this, I would have been having Eddie cook all these dishes on the grill many years ago. Well, what can I say? Live and learn! 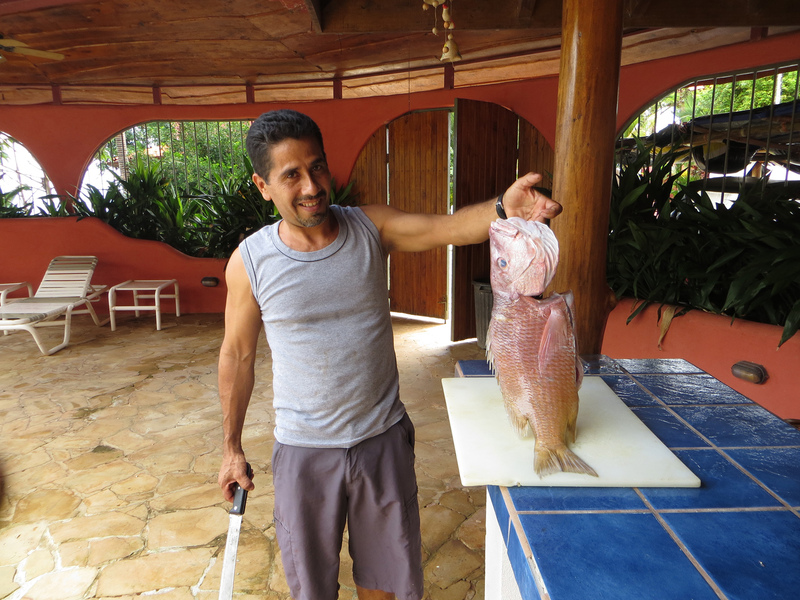 Tonight, we had some of the Red Snapper that Lopez caught Wednesday afternoon on the beach of Guapil using only a hand-line (no fishing pole). 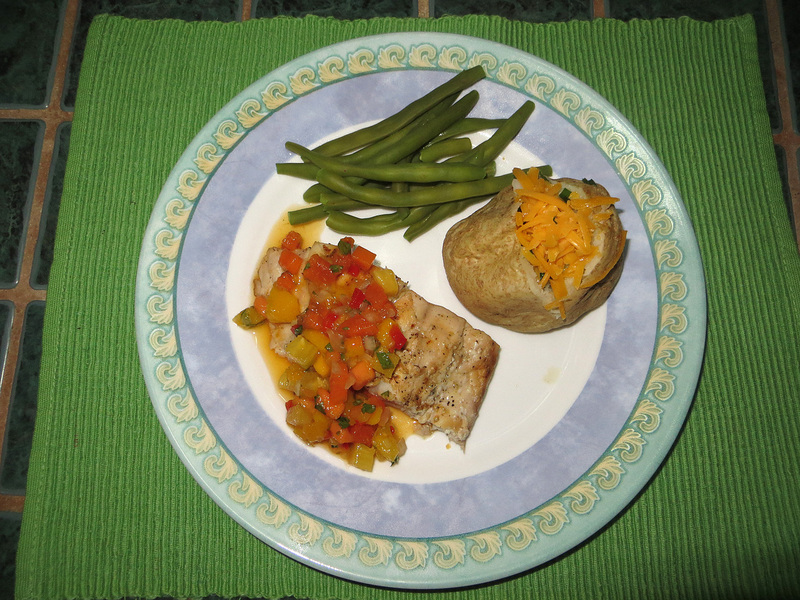 Eddie found a fabulous recipe for Grilled Red Snapper with Tropical Salsa Sauce on-line and he fixed it again tonight. It was a culinary delight! It doesn’t stop here. This past Sunday, Eddie decided to B’BQ pork spare ribs. 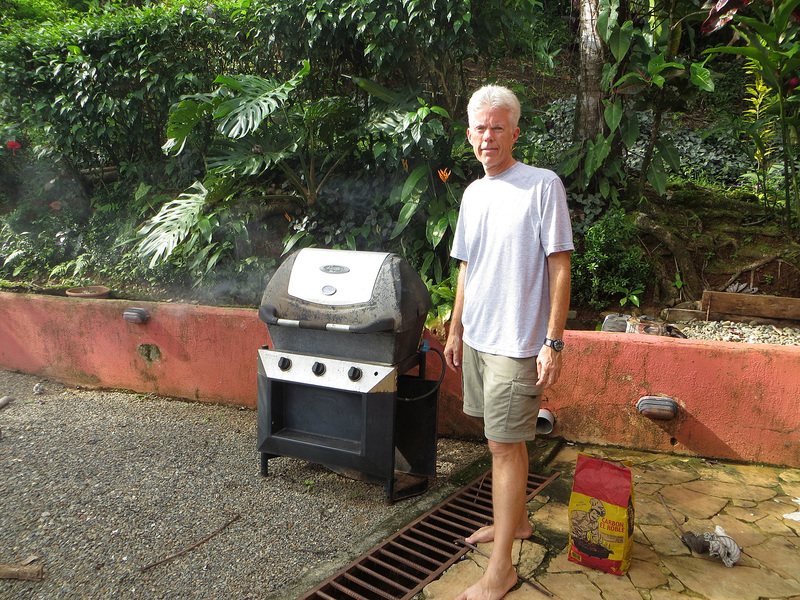 A few days earlier, we went to the butcher in Quepos and he cut the meat to Eddie’s specifications (the American way, which includes the bone). First, Eddie smoked the ribs for three hours using the old grill as a smoker with charcoal and fruit wood. 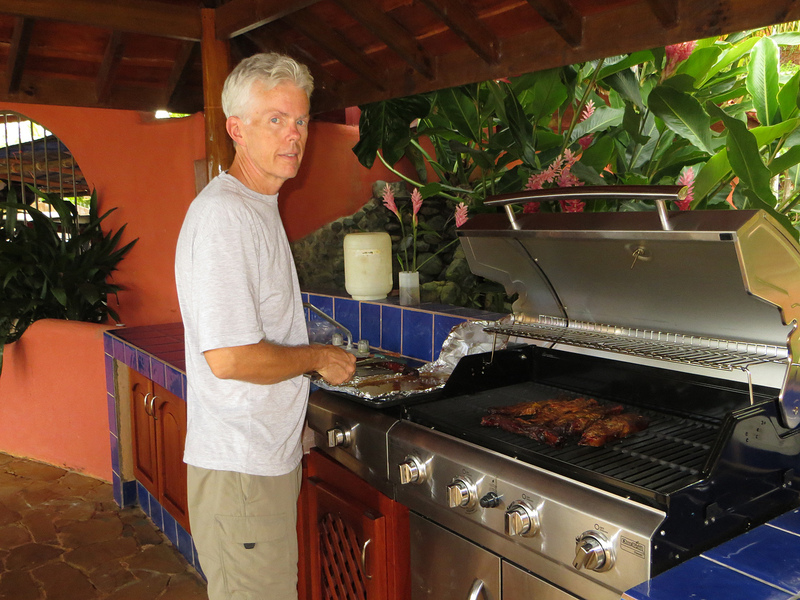 Then, he moved the ribs to the new propane grill and cooked them on very slow heat for another three hours. They were awesome! The meat just fell off the bone. I’m not much of a pork eater, but I must say these ribs were fantastic. We invited Lopez to eat with us and he was impressed, too! Ellen is so happy she doesn’t have to do all the cooking anymore! Is Eddie amazing or is this the amazing Eddie ? I wonder! A little of both, bro! I see my furry friend …. Hi guys, your blog is great. 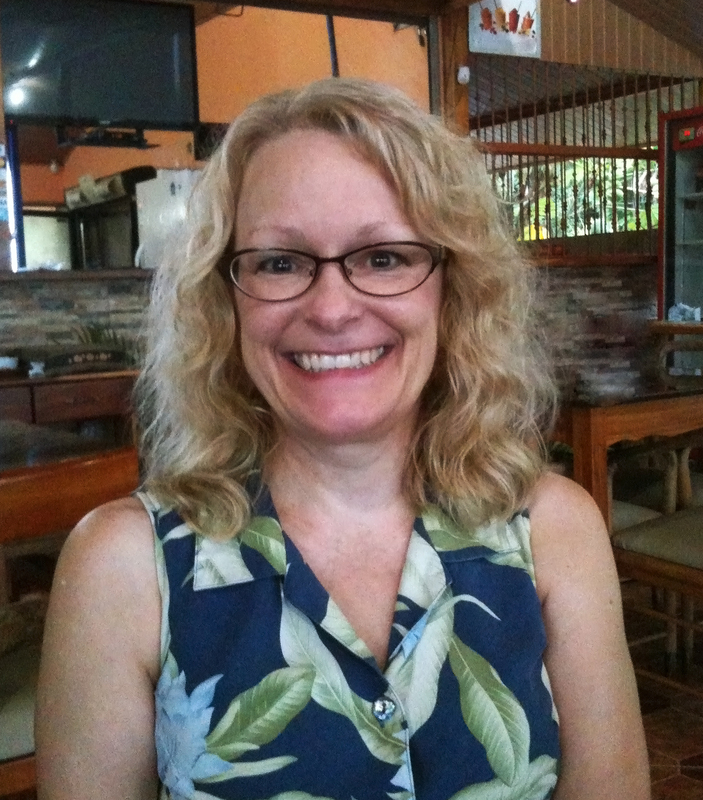 I see now why you chose the Dominical area – it *is* beautiful! But my home in San Roque has its advantages too. Nice meeting you the other day. Hope your fingerprinting went well. Keep in touch! Hmmm, maybe there is a cookbook in your future!!! !